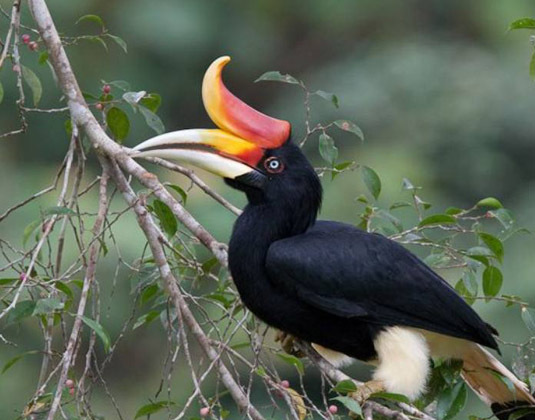 Taman Negara is the oldest primary rainforest in the world, and at 1,677 square miles it is the biggest national park in Malaysia, spreading out over three states, Pahang, Kelantan and Terengganu. Estimated at 130 million years old, this vast and verdant jungle is a tangle of ancient trees dwarfing an incredible variety of ferns, fungi and rare plants. Taman Negara is well equipped with marked jungle trails, most of which can be done under your own steam providing you are reasonably fit, although it is far better to be accompanied by a guide if you are unaccustomed to jungle conditions. Other activities and attractions include fishing, bird watching (there are over 250 species in Taman Negara), adventurous cave explorations, river cruises and visiting the Orang Asli (Batek and Semokberi) people in their villages for a glimpse of their nomadic lifestyle. The park’s sheer size does mean much of the indigenous larger wildlife (including elephants, tigers and leopards) is able to stay well hidden, but you’ll certainly hear the insects and birds and may well see lizards, small deer, snakes and the occasional monkey swinging between the branches high above you. Get your own bird’s eye view of the forest from the fantastic canopy walkway, a 147 feet high and 1,673 feet long suspension bridge between the treetops. Our vastly experienced travel advisors are passionate about Cameron Highlands. With first-hand knowledge they can advise which resort and hotel is best for you to create the perfect holiday, at the best possible price.